Adopting successful climate change mitigation policies requires the public to choose how to balance the sometimes competing goals of managing CO2 emissions and achieving economic growth. It follows that collective action on climate change depends on members of the public to be knowledgeable of the causes and economic ramifications of climate change. 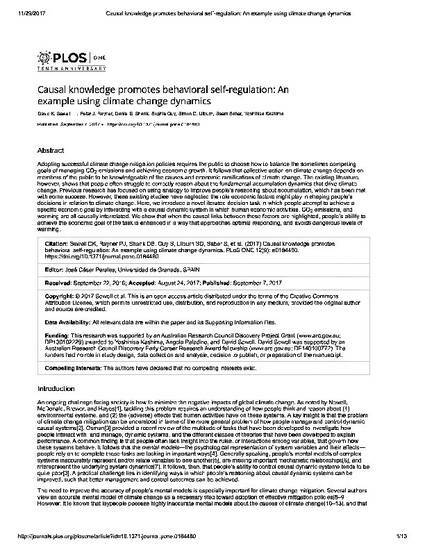 The existing literature, however, shows that people often struggle to correctly reason about the fundamental accumulation dynamics that drive climate change. Previous research has focused on using analogy to improve people's reasoning about accumulation, which has been met with some success. However, these existing studies have neglected the role economic factors might play in shaping people's decisions in relation to climate change. Here, we introduce a novel iterated decision task in which people attempt to achieve a specific economic goal by interacting with a causal dynamic system in which human economic activities, CO2 emissions, and warming are all causally interrelated. We show that when the causal links between these factors are highlighted, people's ability to achieve the economic goal of the task is enhanced in a way that approaches optimal responding, and avoids dangerous levels of warming. © 2017 PLOS, All rights reserved.